S.A.L.T.Y.-Leadership and Seamanship Training for Youths - Gold Star Sailing! Support SALTY's Gold Star Healing / Sailing Adventure! Gold Star Teens pay nothing to attend! Due to generous and kind donors like you, we raise 100% of the funds. Only $1,750 fully funds one youth for the entire week including air fare to get there! WHAT IS GOLD STAR SAILING? Gold Star Sailing provides a co-ed, fun, non-threatening and nurturing experience for surviving teens (14-19) of military personnel who have given their lives in defense of our freedoms. 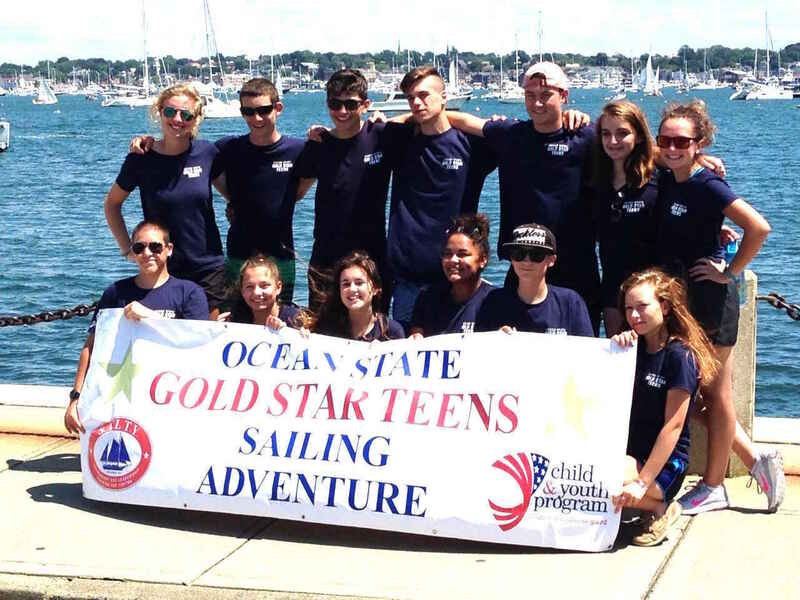 This adult-supervised adventure, aboard sailing vessels in beautiful Narragansett Bay in Rhode Island, offers teens a fun and exciting high adventure experience while healing, learning valuable life skills and the development of enduring friendships with other Gold Star Teens. Thanks to people like YOU, this special Gold Star Sailing is offered at no cost to Gold Star Teens. 100% of your donation goes to support this sailing / healing adventure for these deserving teens whose parents gave their lives in defense of our freedoms. $1,750 fully funds one youth for the entire week, including airfare! Your charitable donation is fully tax deductible and you will receive a donation receipt for your tax return. For the past four years, SALTY (Seamanship And Leadership Training for Youths) a 501(c)(3) non-profit charitable organization, along with support from appreciative businesses, civic organizations, veterans and private citizens has sponsored Gold Star Sailing. Including Clambakes, Campfires and more! Your donation can and will make a difference in the lives of these most deserving teens. THANK YOU for helping them! In support of Patrick Powers who has passionately and tirelessly given to this beautiful organization and the kids for whom he cares so very deeply. This couldn’t be a more worthwhile charitable donation!!! Our complete support. . . Thank you for such a great organization. Here's to another amazing sailing experience for these teens! Norm Bailey told me about this program. As former member of A Co. 2/19th SF I’d like to make a donation to help these young people. Thanks to all the Gold Star Team volunteers for all they do! What a great program!